Fregola is a small Sardinian pasta shape that is very similar to cous cous and lends itself to a range of recipes. It can be boiled like normal pasta but I have cooked it here like you would a risotto so a little time and patience is needed but it really is worth the effort. This recipe uses a mixture of all my favourite seafood and is perfect for a special occasion when a little extra luxury and indulgence is needed. Feel free to add in any extras such as mussels or squid which would also be delicious. I chose to use king prawns that still have the shell on as this adds to the flavour and keeps them beautifully juicy and tender. 1. Get going by heating the olive oil over a medium heat in a wide pan- I use one that resembles a paella pan and it heats evenly and the finished dish looks great in it. Cook the onion and garlic together until softened but make sure it does not colour. Pop in the chilli and cook for a further minute or two- a pinch of chilli flakes can also be used if you prefer but only a small pinch is needed. 2. Add in the white wine and simmer until reduced by half before adding the tomatoes. Cook until the tomatoes are starting to break down and release their juices. Stir in the fregola and ensure it is well combined with the onion mixture. Now for the stock and stirring! Add the hot stock little by little and, as you would with a risotto, add the next amount when the previous has been absorbed by the fregola. Fregola should take around half and hour to become tender. Stir from time to time; I also covered the pan to keep the moisture in. Towards the end of cooking, check and adjust seasoning to taste. 3. Next up goes the seafood and this could not be more simple. All you need to do is add the lobster tail meat, scallops and king prawns on top of the fregola, cover the pan and steam for a few minutes until the prawns and lobster are cooked through and the scallops are tender. Finish with a sprinkling of parsley and serve immediately. Scallop, king prawn and lobster fregola- an impressive meal for many occasions! 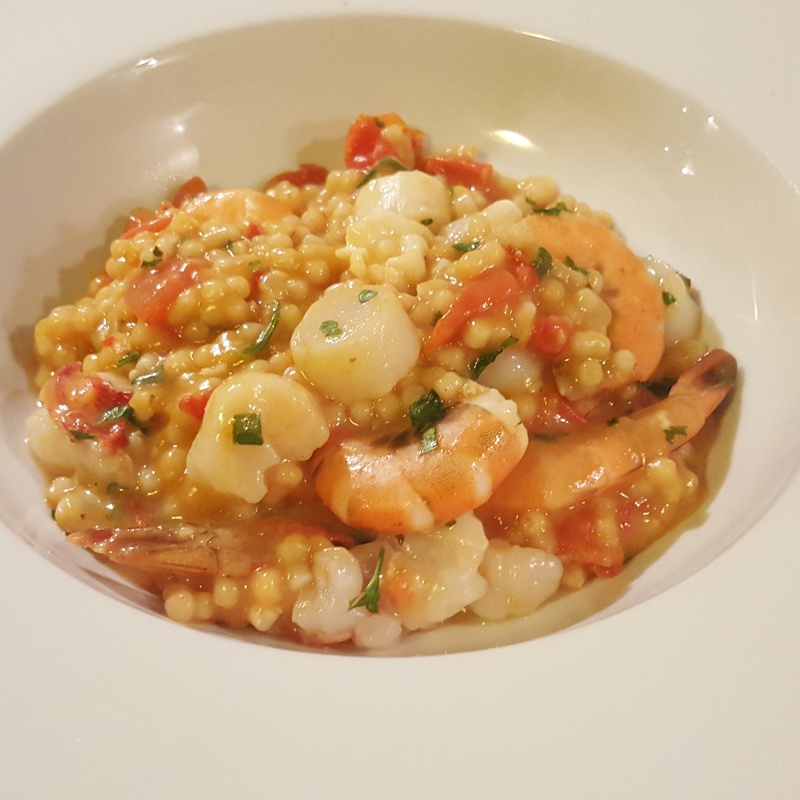 This entry was posted in Recipes and tagged chilli, fregola, garlic, lobster, onion, prawns, scallop by sotiris14. Bookmark the permalink.